I don't get it. 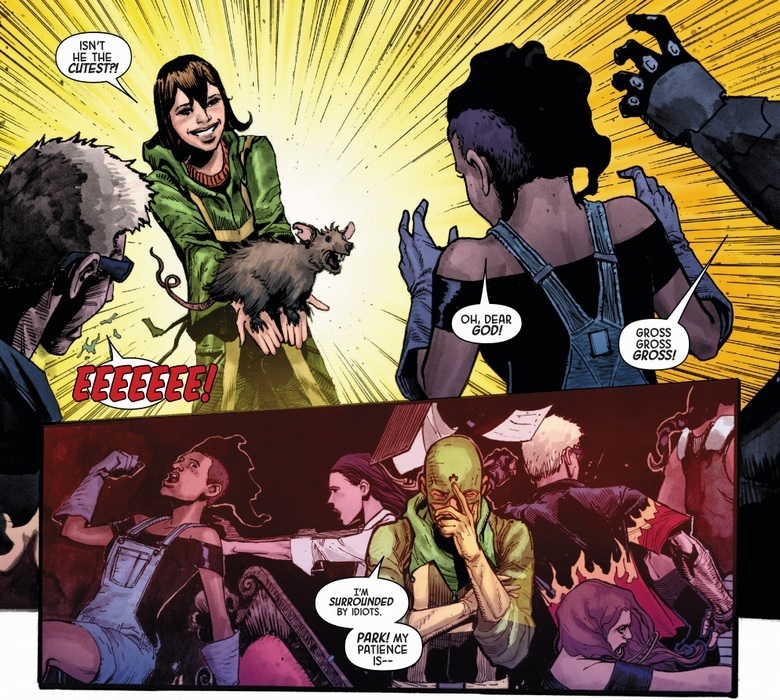 On one hand we have Marvel deliberately straying away from "Hydra are Nazis" and on the other we get allusions to stuff like the Hitler Youth. Marvel's only trying to deny that Hydra is a Nazi organization so that they can try to avoid their richly deserved backlash. Everyone knows what Hydra really is. Anything else is just a cheap excuse. They're Nazi stand-ins but not literal Nazis, is the idea. 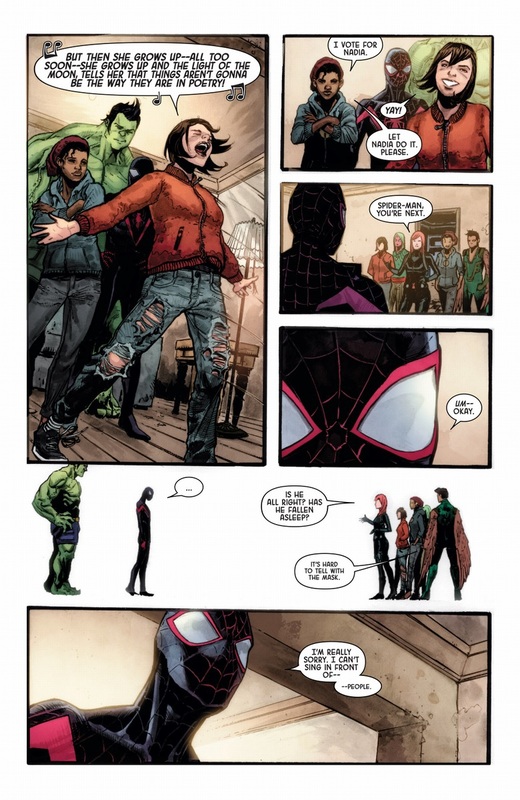 I get the idea but given all the flack Marvel's been getting for the Cap=Nazi aspects and Spencer going on the defensive on Twitter over it you'd think they'd downplay the more blatant connections. 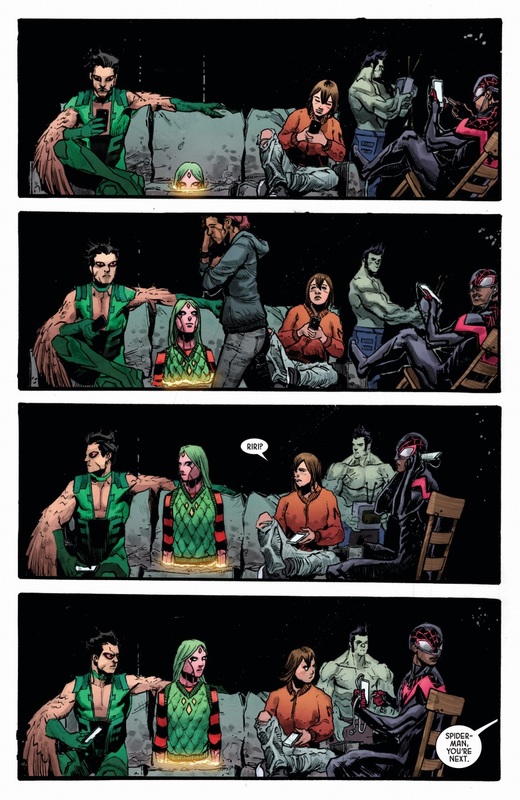 At this point, I think Spencer and some Marvel execs are the only ones still in denial. And they haven't clued in that more than a few of their writers know better. But some of the strongest parallels have been in Spencer's own books. 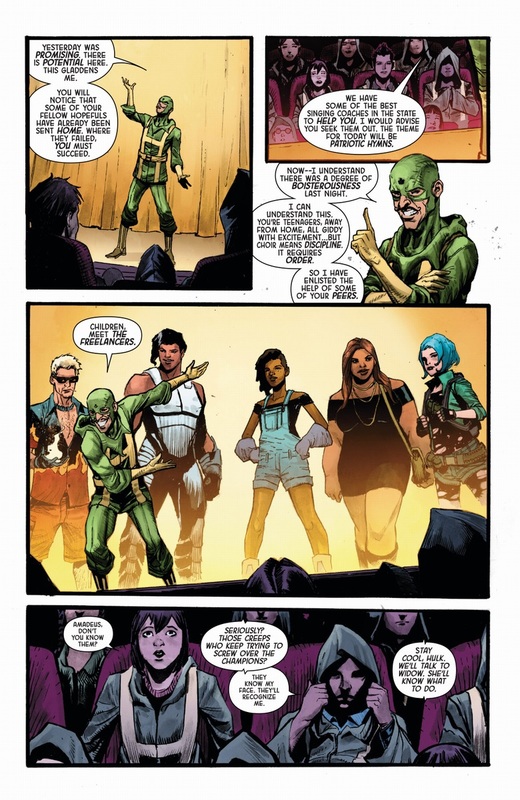 Even the Hydra youth choir here was his suggestion, according to Derek Landy in an interview. 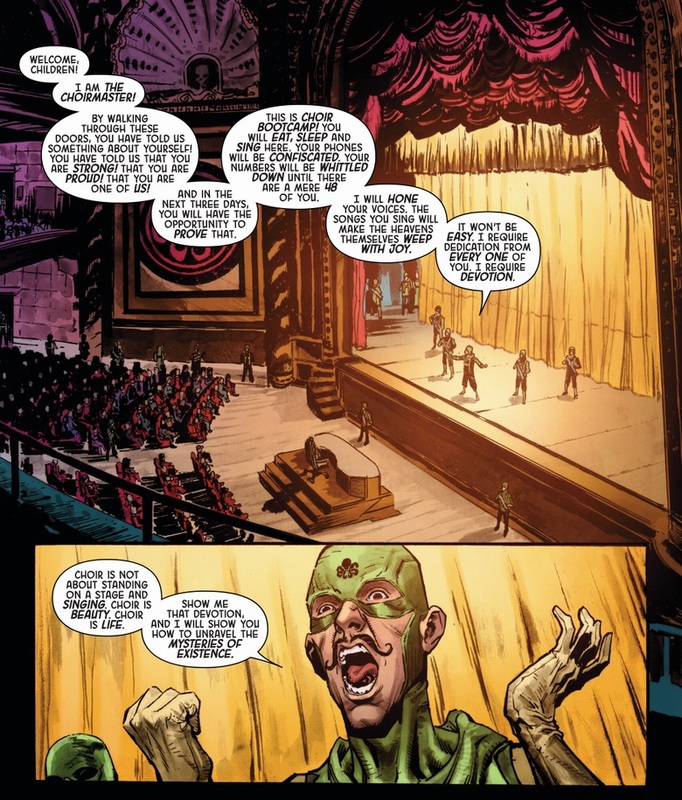 It's clear that he has nothing against parallels -- Hydra are the bad guys in the story, after all -- that his thing is only whether or not they're literally Nazis. They have America Chavez. Why doesn't she just kick open a portal to Hydra Steve or whatever the hell they're calling him, knock him out and drag him back through the portal so they can deal with him? Oh, right. It's an event. America's not on the team. And the planetary shield blocks portals and teleportation anyway. 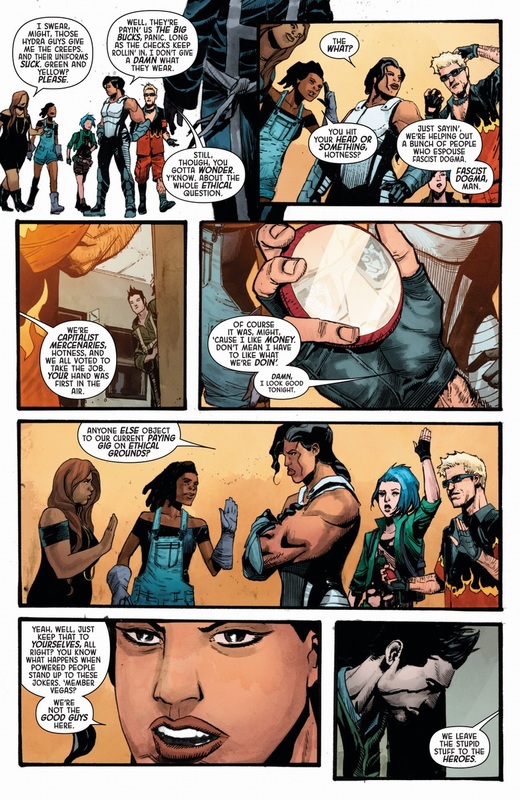 America Chavez is stuck with the Ultimates on the other side of the Shield that surrounds the planet. Yea, they thought through that much. Didn't realise it was Riri, not America. ... it's not because I can be easily duped by two superficially similar humans wearing vaguely similar hats! Such a thing is impossible! 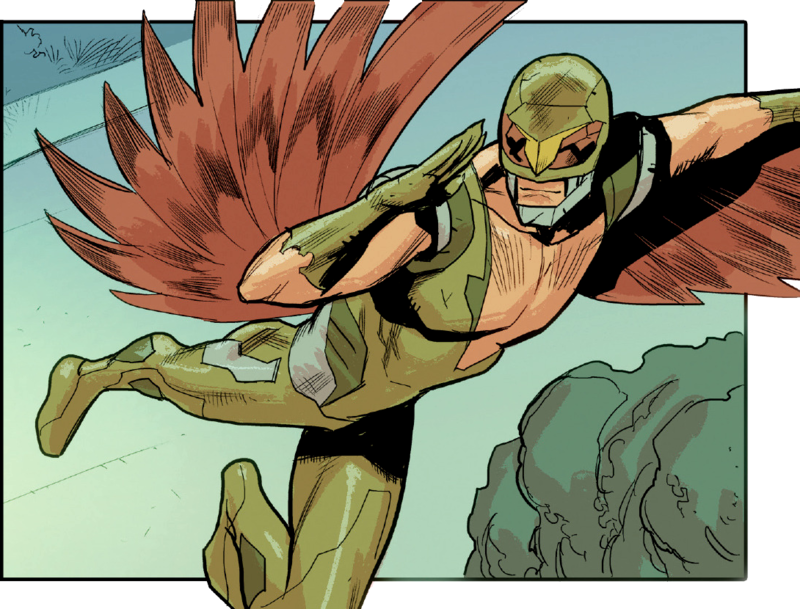 Maybe it's the art, but Falcon looks really freaky, and his costume is highly ugly. I like the bit with the Freelancers actually having a conversation about the ethics of their job... even if it's to show that they're mercenary assholes. At least they're not completely one-dimensional. 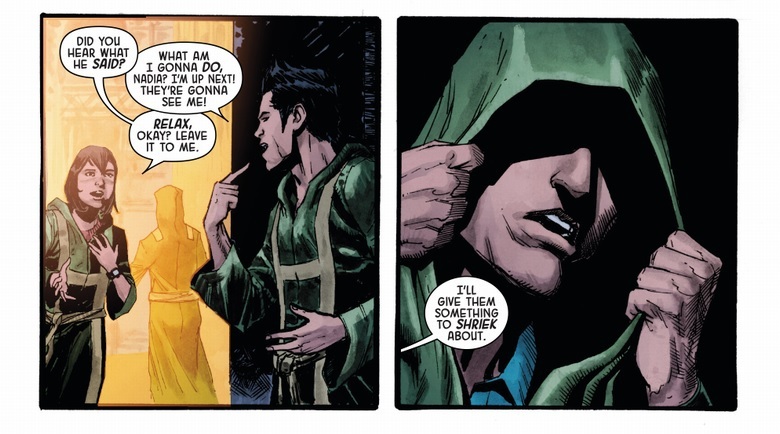 Sounds like they're going to bail the moment things turn against HYDRA. Given some of the places the show went, I'm a little surprised there was no Nazi episode of Glee. You have to respect a man who has said he's made it his life mission to make Hitler look so ridiculous that no one will ever be able to take him seriously. fun story, I saw this on stage. the people who were sitting next to me, apparently had season tickets, and had no idea what they were in for when they went to the Producers. they kept LOOKING at me during the performance, and muttering to one another, asking why I was laughing so hard at something so offensive. 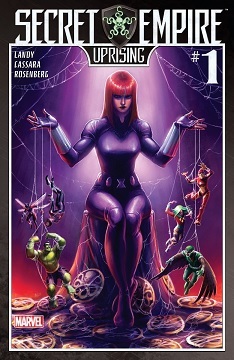 I have mixed feelings about Natasha here. The scene of the talk room was… well, if I'm to be frank, it was kinda badass. I'm a sucker for people underestimating the power of language, then getting over their heads (the scene reminded me of Joker tauting Batman in Arkham: "sticks and stones, right?"). 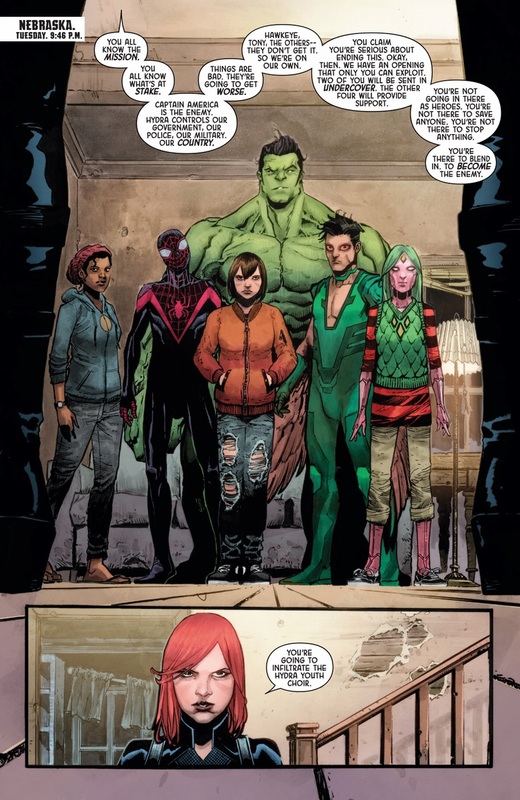 However, getting Natalia of all people to indoctrinate children away from ethics, with friggin’ Red Room techniques, under the premise that terrible ends justify drastic means, seems to me a blatant case of Marvel's main sin, viz. throwing into the trash all her recent character development. I'd be 100% ok with this scene if it was Yelena running the operation instead. 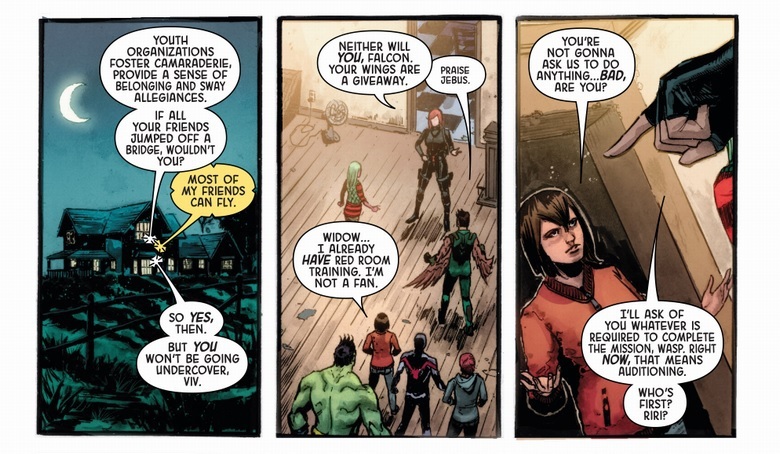 She'd be pretending to be horrified by Hydra and resigned to a repulsive course of action when, in fact, she'd have some ulterior motive (perhaps hired by another villain who happens to be anti-Hydra at the moment). Natalia would be missing, presumed dead, locked somewhere with nothing but the clothes on her body and no possibility of escape. She'd obviously escape, gloriously, and pop into scene right in time to prevent the kids from embracing amorality, and offering them a way out of Yelena's subtle priming. As it stands, I still hope that someone in Marvel is paying attention and the whole "get a kid to kill Cap" thing is a façade for some sort of mastermind plan not involving children assassins. I can only hope things are not what they seem here. I also expect they have some sort of twist for the whole "Miles kills Cap" prophecy thing. 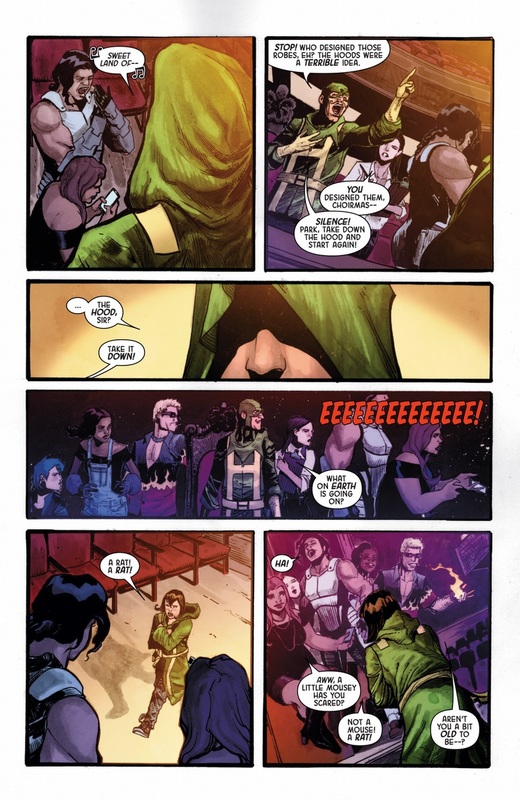 Except Yelena is evil, so the heroes wouldn't have reason to trust her. Plus, Yelena is a Cyborg. 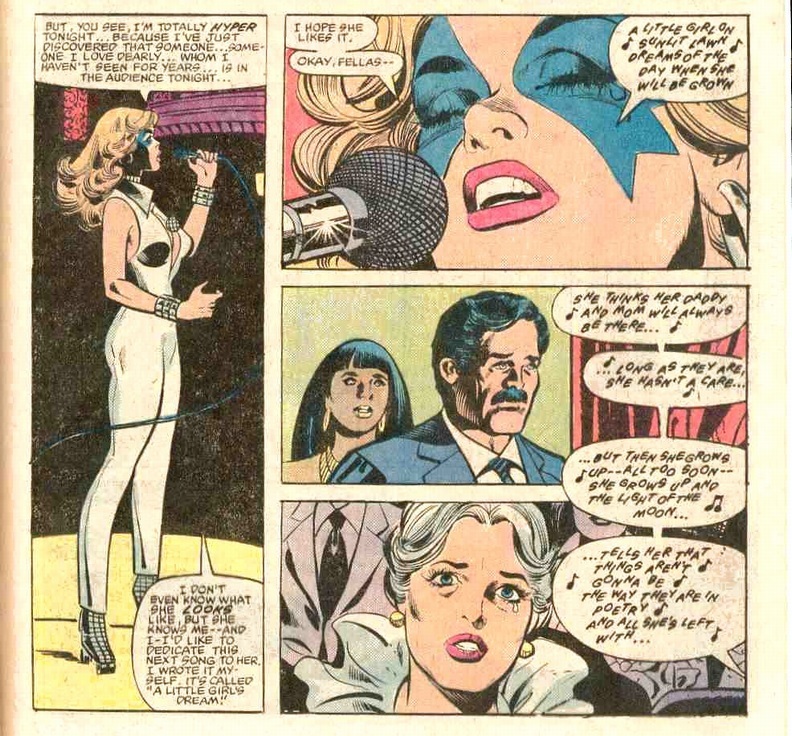 I would argue that, properly, Yelena is amoral; but yes, that's kind of the point. What Natalia is doing is amoral or evil, so I'd rather have an amoral character do it. It's much easier for me to come up with an excuse to make the heroes tentatively accept the help of Yelena than to reconcile how, right after rescuing those girls from the Dark Room horror in the Weeping Lion arc, right after expressing her feelings about it as strongly and memorably as she did, Natalia just decided to become a new Headmistress herself at the first sign of trouble. 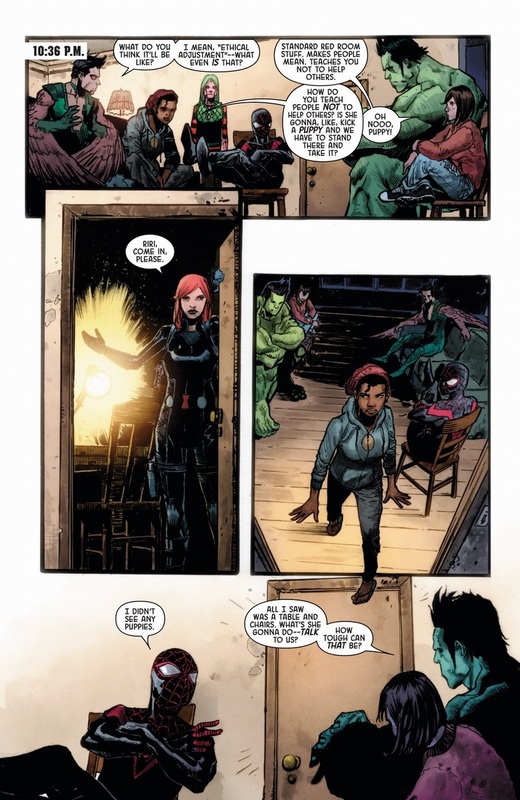 I see that the indoctrination continues with a picture of Cap in the living quarters. Everything this guy stood against is now what he's using as HYDRA's Supreme Commander. Ugh! Will they celebrate the Fourth of July and call it his birthday (which it is) instead? Dictators love for the country to celebrate their birthdays. 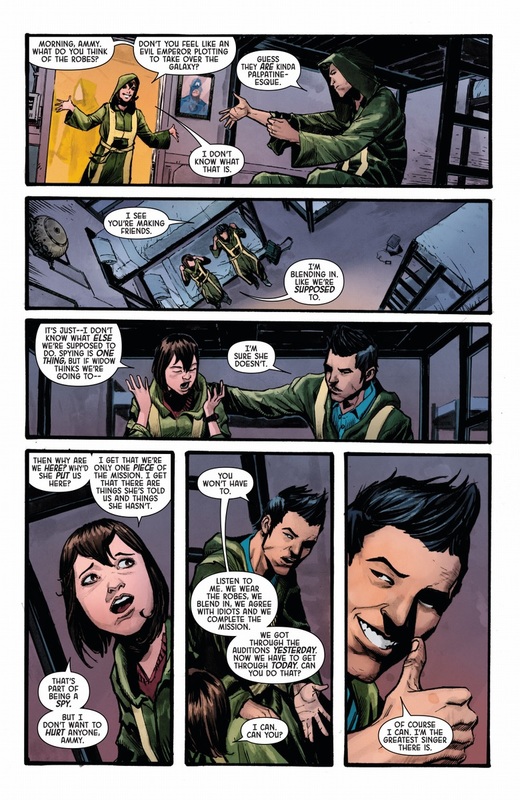 if Steve were REALLY serious about the whole "Hydra isn't really evil" thing, shouldn't he have gotten a guy who DIDN'T have a pedo-stash be in charge of the kids? Wild shot, but I think one of the Freelancers is going to recognize Cho, but not rat him out.